Sparta Engineering specializes in the prototype engineering of materials for a variety of industries. Their design process turns customer ideas into reality through the stages of: idea generation & communication, data & parameters, concept development, analysis, detailed modeling, prep for manufacturing, production, and support. Sparta Engineering recognized an opportunity to enhance its design process with an iPad app. Sparta chose CollegeMobile because we had previously developed similar, high-quality tablet apps, and also had a good amount of the code base ready to go. Imagine that you wanted to build a new deck (sorry, our apps can’t do that for you! ), but you can’t meet face-to-face with a carpenter to plan it out before the big day. You could send an email with a picture of your house, explaining where the deck would end at each side, how high it would be, where the railings and stairs would be, where the additional levels would be, where gas meter and lines would be, etc. This is similar to explaining an engineering idea for a truck or rig. Sparta wanted to overcome this communication channel barrier, go above and beyond customer expectations, and further improve its competitive advantage. The end product that emerged was DesignShare, a tablet app designed to alleviate channel barriers. 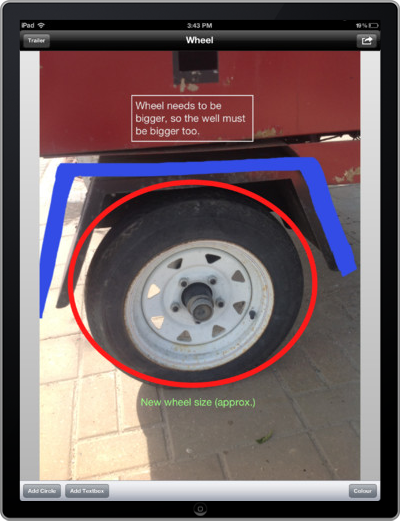 The DesignShare iPad app, developed by CollegeMobile, allows customers to take photos, annotate these photos with text boxes, circles, and freehand sketches, and then email them directly to a Sparta Engineering address. Talk about improving efficiency!